Everything you need to know to make every room pop. What are the main benefits of PINALEN®? PINALEN® Multipurpose Cleaners cleaning products will clean, degrease and deodorize your entire home. Is PINALEN® a good degreaser and stain remover? PINALEN® Original Multipurpose Cleaner contains 3X more pine oil than major competitors. Pine oil is known for its heavy grease and stain removal capabilities on all kinds of surfaces including vinyl and linoleum. Our pine-oil based products clean carpet and rug stains without damaging, decolorizing, or bleaching fabrics or textures. 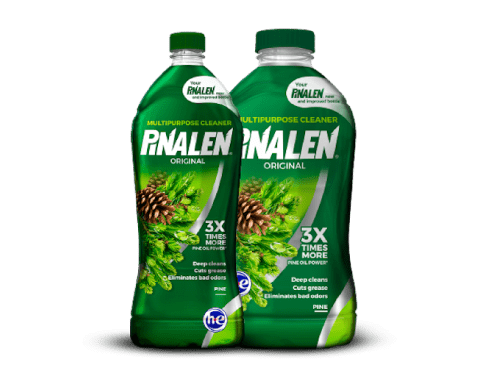 Is PINALEN® a good laundry booster and deodorizer? PINALEN® Multipurpose Cleaners can be used on white and color-fast fabrics, either along with your regular detergent, by soaking or applying directly to clothing. Try PINALEN® Multipurpose Cleaners on your sport clothes to see how effectively it removes bad odors. You can pretreat stains for dirt, gum, make up, and grease from fast food to bicycle chains. PINALEN® Multipurpose Cleaners act as a deodorizer in your laundry and eliminates built-up dirt from your clothes. Just add 1 cup of PINALEN® Multipurpose Cleaner to a medium load with regular detergent. What are the ﬁrst aid measures for PINALEN®? If swallowed, call the Poison Control Center or a doctor immediately for treatment advice. Have person sip a glass of water if able to swallow. Do not induce vomiting unless told to do so by the Poison Control Center or doctor. Do not give anything by mouth to an unconscious person. If product gets into your eyes, hold eye open and rinse slowly and gently with water for 15-20 minutes. Remove contact lens if present after the ﬁrst ﬁve minutes, then continue rinsing eye. PINALEN® Multipurpose Cleaners removes stains from your carpeting, even red wine and cleans dust and dirt from walls, ceiling fans, windows and ﬂoors. PINALEN® Multipurpose Cleaners cleans the dirtiest ﬂoors, tile, bathtubs, sinks and toilets. PINALEN® Multipurpose Cleaners removes stubborn grime and grease from stoves, ovens, range hoods and walls. PINALEN® Multipurpose Cleaners deodorizes and eliminates spots on doormats, carpets, dashboards and even whitewall tires. PINALEN® Multipurpose Cleaners removes oil stains from your tools and grease marks left from bicycle chains. 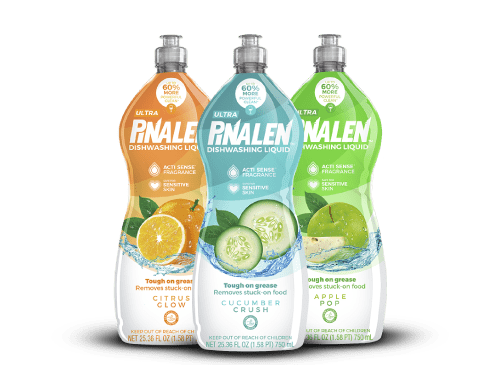 Are the PINALEN® bottles recyclable? Yes, every PET bottle is made with 100% recycled plastic. What sizes does PINALEN® come in? PINALEN® Original: 28 fl. oz., 56 fl. oz., 128 fl. oz., 304 fl. oz. PINALEN Max Aromas® Lavender: 28 fl. oz., 56 fl. oz., 128 fl. oz., 304 fl. oz. PINALEN Max Aromas® Floral: 28 fl. oz., 56 fl. oz., 128 fl. oz., 304 fl. oz. PINALEN Max Aromas® Lemon: 28 fl. oz., 56 fl. oz., 128 fl. oz. PINALEN Max Aromas® Ocean Breeze: 28 fl. oz., 56 fl. oz., 128 fl. oz. 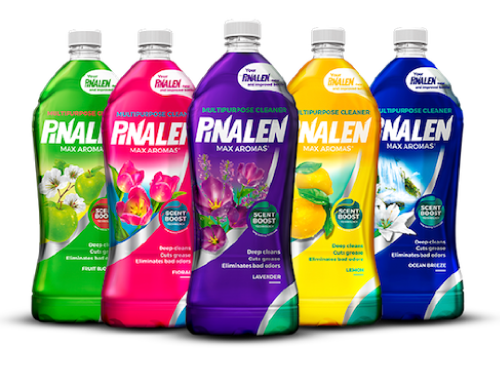 PINALEN Max Aromas® Fruit Blossom: 28 fl. oz., 56 fl. oz., 128 fl. oz. What do each of the PINALEN® scents smell like? PINALEN® Original smells like you’re walking in the middle of a cool, crisp pine forest. PINALEN Max Aromas® Lavender is a fresh and sophisticated fragrance built on a fougere base, with lavender and eucalyptus. PINALEN Max Aromas® Floral has the self-indulgent fragrance of fresh ﬂowers mixed with the sweet hint of roses. PINALEN Max Aromas® Lemon mixes the scents of lemon (of course) bergamot, and orange to give an eclectic citrus twist. PINALEN Max Aromas® Ocean Breeze combines waves of aromatic jasmine, iris, fresh rosemary, and warm sandalwood. What PINALEN® promotions and discounts are available? PINALEN® offers special promotions and coupons throughout the year. Check back frequently to see what’s new. Where can I redeem the 100% Guarantee? Visit our 100% Guarantee page at www.alenusa.com. If you’re not completely satisfied with its versatile and fragrant cleaning power, we will give you your money back, guaranteed.